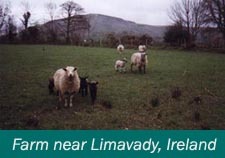 William King was born on Nov. 11th, 1812 and grew up on the family farm near the village of Newton-Limavady in Ireland. By his own account he was a rather “wild” child and received his share of discipline from the local teacher, “who was a good classical scholar but of a hasty and violent temper”. At 15 he was sent to Colerain to study Classics, and in 1830 traveled to Scotland to begin studies at the University of Glasgow. He graduated in 1833 and soon after was on board a ship to America. Like many others, his parents had dreams of making a better life for themselves in the United States, and so they sold the farm and settled on a tract of land in the wilderness of Ohio. William helped the family clear the land, build a cabin and work the farm, but with a university degree he longed to pursue a career in teaching and in November 1835 he set out on his own. He headed south and found employment as a school teacher to the children of several large families of plantation owners. 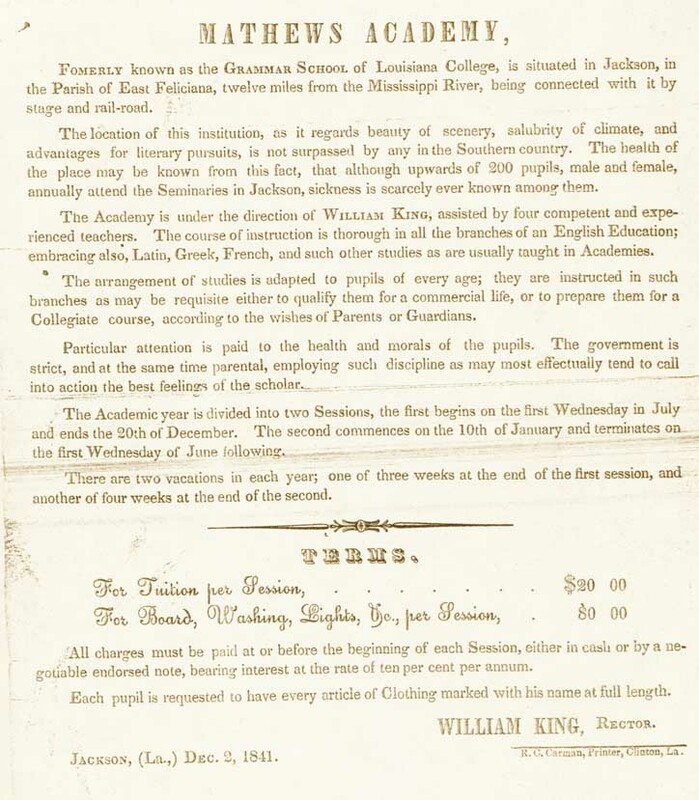 However, his reputation as an excellent educator quickly grew and in a few years he was offered the job of Rector, or “Head Master”, at Mathews Academy, the preparatory school for Louisiana College. While in this position William acquired a measure of wealth, mingled with the privileged of Louisiana society, married the daughter of a large plantation owner, and even owned a few servants. On the Sunday before beginning his work at Mathew’s Academy he listened to the words of his predecessor, who in his farewell address preached from the Gospel of Mark, “For what shall it profit a man, if he shall gain the whole world, and lose his own soul?” This text stayed with William, and he credits it with having a “forceful effect” on his life. After the birth of his son, Theophilus, William became more concerned about the society in which he would be raising his family. This opportunity came soon after. Through the newspapers, William had followed closely the events leading to the formation of the Free Church in Scotland. He was deeply moved and after thoughtful prayer heeded the call to enter the ministry. By December 1843 he was back on board a ship, returning for further studies in Scotland. He was examined by The Rev. Dr. Candlish and accepted into the Free Church College, where he studied for the next three years under the guidance of the The Rev. Dr. Thomas Chalmers, leader of the movement that formed the Free Church of Scotland.